Fort Worth and Texas said good-bye last year to one of its favorite authors, native son Gary Cartwright (left). Along with fellow Fort Worth authors Dan Jenkins and the late Bud Shrake (in the photo at left with Cartwright, far right), Cartwright embodied an era of hard-charging, hard-writing sports reporters who later became novelists. 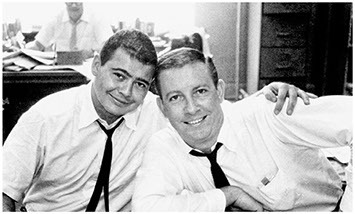 He mastered long-form journalism at Texas Monthly with pieces on the Cullen Davis murder trial and stripper Candy Barr, among other topics. Indeed, many of Fort Worth’s journalists have gone on to become authors—Sandra Brown, Jeff Guinn, and Julia Heaberlin are a few recent literary successes. Texas’s daily newspapers have also served as a quasi-book boot camp for a generation of aspiring authors. 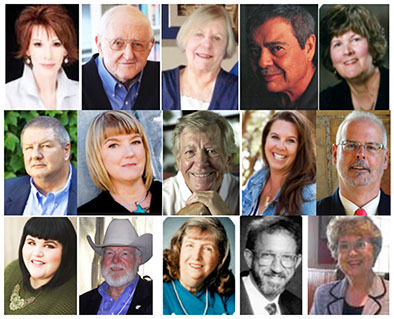 << PROVEN WORTH From upper left, authors associated with Fort Worth: Sandra Brown, Dan Jenkins, Judy Alter, Gary Cartwright, Jan Jones, Jeff Guinn, Julia Heaberlin, Bud Shrake, Karla K. Morton, Glen Ely, Julie Murphey, Red Steagall, Ann Arnold, Richard Selcer, J’Nell Pate. 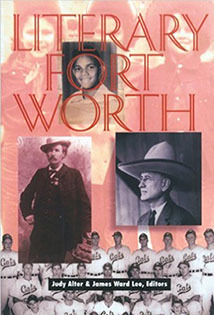 Other authors connected to Fort Worth include James Reasoner, Kathy Cruz, David R. Davis. A leader in literary regional letters based in Fort Worth, Texas Christian University Press has traditionally published the history and literature of Texas and the American West. As the press has grown steadily in stature and in its ability to bring credit to its parent university over the last twenty years, it has been praised for its regional fiction, which often doesn’t find a market in New York, and for discovering and preserving local history. It continues to venture into new areas from true crime, with books such as Dateline: Purgatory by Kathy Cruz, to an account of the craft of distilling in Shots of Knowledge: The Science of Whiskey by Rob Arnold and Eric Simanek. TCU Press even publishes fiction, such as the acclaimed Sins of the Younger Sons by living legend Texas author Jan Reid. TCU Press has several established series and some new ones. Its Texas Tradition Series reprints classic Texas literature that might otherwise disappear from bookstores and libraries—with novelist Elmer Kelton as its mainstay. The Chisholm Trail Series offers books that capture the history and culture of Texas, and Chaparral Books for Young Readers are historical fiction for middle-school students, aiming to captivate youngsters with Texas history. The Texas Biography Series, sponsored by the Center for Texas Studies at TCU, offers scholarly, documented biographies of lesser-known Texans—Sam Houston and Stephen F. Austin have been covered extensively, but many who made strong contributions to Texas history have not. The first volume, Emily Austin of Texas: 1795–1851, by Light T. Cummins, won the 2010 Liz Carpenter Award for Research in the History of Women. Edmund J. Davis of Texas: Civil War General, Republican Leader, Reconstruction Governor by Carl H. Moneyhon appeared in 2010, while Fighting Stock: John S. “Rip” Ford of Texas by Richard B. McCaslin appeared in 2011, and in 2016, Adele Briscoe Looscan: Daughter of the Republic by Laura McLemore. TCU Press is also home to the Texas Poets Laureate series, books collecting recent and new work by the Texas poets laureate beginning with Alan Birkelbach, 2005, through Karla K. Morton, 2010 Texas poet laureate. Fort Worth’s been called the place where the west begins, and that frontier spirit contributes to the name of its most popular and still evolving literary/cultural festival. The first-ever Fort Worth BookFest was held in October, and the second annual festival is slated for October 14, 2018, from 9 a.m. to 6 p.m. at the Tarrant Community College, Trinity River Campus. in Fort Worth. Organizers describe the festival as a cross-cultural, community-driven, multi-genre literary event, designed to “provide a platform for raising awareness of the transformative power of literacy” in Fort Worth and throughout the Southwest. For more information about Fort Worth BookFest, and sponsorship, volunteer, and participation opportunities, contact Reba Henry at (817) 929-4054 or fwbookfest@gmail.com. Visit the event website at www.fortworthbookfest.com. Turn another page of Fort Worth’s history at the Fort Worth Public Library. The Central (downtown) library devotes the entire month of June to local history, with special events. The FWPL offers an extensive variety of literary-related events and community outreach year-round. It also famously hosts the Texas Literary Hall of Fame (left) Founded by the Friends of the Library in 2004, the Texas Literary Hall of Fame honors authors whose body of work enhances Texas’s literary heritage, is original and first published in this country, and has already been recognized for its literary significance. Held biennially, the Hall of Fame is commemorated by the “Texas Tales” painting by Marjorie Stark Buckley hanging in the west wing of the Central Library. 2018 is an induction year for TLHF, so stay tuned for news of the newest honorees! The library is also hosts the Worth Reading Series, bringing many visiting writers to the city. For readers who’d rather own their books than borrow them, Fort Worth boasts some eighteen new and used bookstores. Although The Last Word Bookstore, which opened in 2016 and was voted “Best Bookstore 2016” by Fort Worth Weekly, closed a little more than a year later, the city is still well served by a variety of booksellers, including Monkey and Dog Books, a children’s bookshop nearby, hosts events throughout the year and a storytime every Wednesday and Thursday at 10:30 a.m. Fort Worth is also home to the Dock Bookshop, the largest independent, full-service, African-American owned bookstore in Texas and the Southwest, which opened in 2008. The Dock hosts a long-running Poetry & Open Mic Tuesday nights at 8:00. Located in greater Fort Worth are four Barnes & Nobles, three Mardel Christian book stores, seven Half Price Books stores, two Lifeways and a Books-a-Million. Nearby indies include The Full Cup Bookstore and Coffee Shop in Weatherford (right) and the Published Page in Cleburne, which often joins with the bookbinders from the Layland Museum of History in Cleburne on workshops on the care, repair, and treatment of old books. Fort Worth’s extensive array of world-class museums offer a variety of unique books to purchase as well. The Sid Richardson Museum has a book club, happy-hour trivia, and regular Tea Talks with authors and thought leaders. Visitors can even ride Molly the Trolley to the Tea Talks — it’s is a vintage-look trolley with all the modern amenities and is a free, quick and convenient way to travel around downtown Fort Worth. 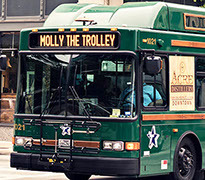 The Molly route travels from the Fort Worth Convention Center to Sundance Square 7 days a week. Service runs 10 a.m.-10 p.m., with time between trolleys about 10 to 15 minutes. At the Modern Art Museum visitors can view the monumental Anselm Kiefer sculpture "Book with Wings," or stroll the Trinity Trails park area to view sculptures representing a wide range of literary history — from Mark Twain reading a book, to Dr. Seuss figures. 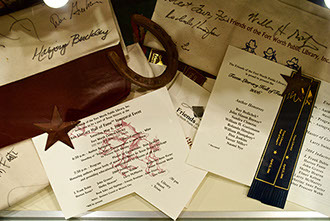 While in Fort Worth, don’t miss the National Cowgirl Hall of Fame, which also has an eclectic mix of books in its museum store. 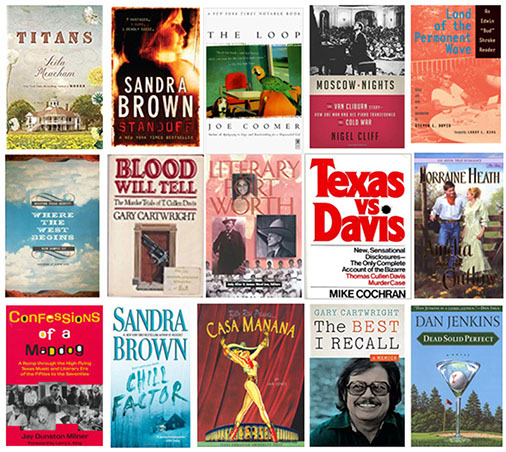 << COWTOWN COLLECTION Literary Forth Worth, a 2002 anthology of classics and more recent writers, provides insights into the city’s literary landscape.